Kareem Abdul-Jabbar has the accolades and the historic records but can he dance? The Crossover chatted with the Hall of Famer about participating in Dancing with the Stars and the NBA playoffs. Dancing with the Stars has a rich history of promoting retired athletes and highlighting the footwork and precision that remains with them long after their playing careers. That said, Kareem Abdul-Jabbar, who retired from the NBA almost 30 years ago, might not be an obvious choice to join the show. He’s an accomplished 71-year-old man, with 14 books, the Presidential Medal of Freedom and American Cancer Society work to his credit. Of course, we know about everything he’s achieved in his life—including the creation of the skyhook—but what does he know about the cha-cha? 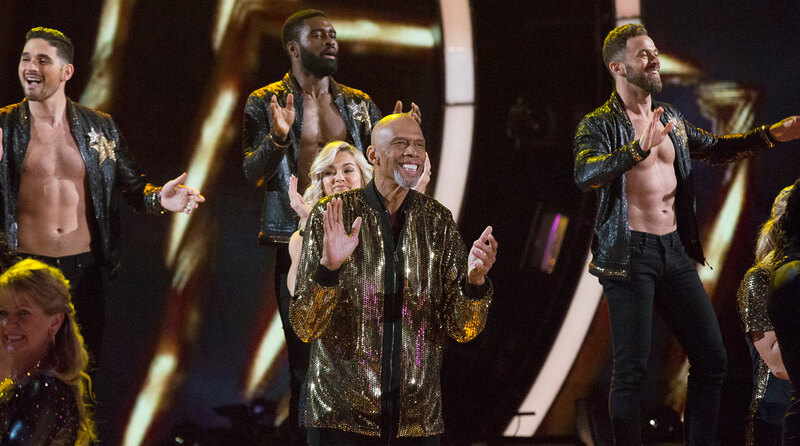 Abdul-​Jabbar had little doubt that he could compete once he received the call, and he took some time away from the salsa to talk to The Crossover about Dancing with the Stars, the NBA playoffs and the historic run of LeBron James. DeAntae Prince: So first question: Did you get the call? Are you a fan of the show and decided to seek them out? Kareem Abdul-Jabbar: They called me. They contacted my agent and she asked me if I wanted to do it and I said, ‘Yes,’ and she was surprised. But I always felt that maybe I could do this. I had watched Emmitt Smith and Derek Fisher compete and kind of rooted for them so I figured maybe I’d try it myself. DP: That actually leads to one of my questions. Athletes often win this because of the footwork element. Do you feel like you have a shot based on that? KAJ: Well, you know, just being agile and having to be quick and consistent in my movement I think gives me an idea that maybe I could do it, but you know the proof is always in the pudding. DP: How much dance experience do you have? Do you remember some old moves from Harlem? Pick up any disco in LA in the 70s? KAJ: Combination. You know, growing up in New York you pick up any number of types of dances—Latin, R&B, MoTown. So I’ve always been into the music and this was natural progression. Is LeBron James the Greatest of All-Time? DP: Is there something you’ve learned about the world of dance that you didn’t know before this experience? KAJ: It’s a lot tougher than I expected it to be. You think you can do all the moves, but to do all the moves at the right time and place in coordination with the other dances—that is tough. You have to know your choreography and know your cues and where to move. That’s what gets to you. You get confused and out of place, you look up and you’re screwing everything up. DP: So it sounds like you had to be coached a bit. Were you coachable? KAJ: Yeah, I am coachable. I was very lucky to be working with Lindsey Arnold, a choreographer and dancer who won the award last year. She’s an awesome, very sweet lady. DP: I saw some video and you look pretty spry out there. How is your health? KAJ: I feel pretty good. I’m not a spring chicken anymore, but I think people my age are denying themselves the pleasure of life if they don’t continue to enjoy the things that are meaningful to them. DP: I’m sure you’ve invested a lot of time in perfecting your cha-cha and salsa, but have you had time to watch any of the NBA playoffs? KAJ: I looked at a couple games and I know the folks up in Utah are really happy and I know the folks in Toronto are scratching their heads and angry. DP: I know you’ve seen a lot of greatness in your career. What do you think about the job LeBron has done of carrying his team through these first two? KAJ: Well, that’s one hell of a job to try to do. He seems to be able to get it done on a regular basis, so my hat is off to him. DP: He’s started to get to that place where yourself and Michael have been, where you start to break records. People talk about the actual achievement, but how hard is it to be consistent enough to get there? KAJ: A lot of it has to do with luck. If you get injured, you can’t expect to play as well and long as you would like to. So the fact that LeBron has not been hurt and has all this great talent and leadership quality—that’s why he’s able to do what he does. DP: At SI we recently had a big story on the Lakers and how they’re building toward the future. How do you feel about the state of the Lakers right now? KAJ: Well, if they can get one or two key players they can be real contenders. They have a talented group of young players. They need a stud on the frontlines for leadership and things a player of that quality can bring to a team, but they’re only a player or two away. DP: People always talk about your time with the Lakers, but you won two titles with the Bucks alongside Oscar Robertson. What was it like to see Giannis lead that team to the playoffs and see Milwaukee experience some success? KAJ: I’m happy for the franchise. It’s a great franchise, they were so good to me. They treated me like royalty, man. I still on a regular basis run into people who rooted for me back in the ‘70s when they were kids living in Wisconsin, so there’s a special place for them in my heart because of how they were just so gracious and appreciative of what I did while I was there. DP: Speaking of Oscar, I’m curious to know what you think about the comparisons to Russell Westbrook. I don’t know if they play alike, but there’s that triple-double element. KAJ: There’s no similarity. Westbrook is a lot more active in terms of trying to dominate the game at both ends of the court. Oscar tried to get his teammates involved a lot. Westbrook only has one speak, and I’m not putting him down. He’s a very effective player, but he has a style of play that sometimes doesn’t let the other guys become involved.